Are audio beeps while using Skype annoying you? 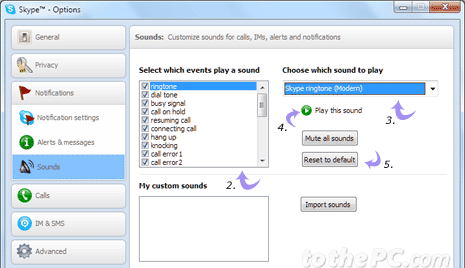 Fortunately, you can mute all (or specific) event audio beep sounds in Skype program. You can also customize beeps in Skype and configure sound settings to set your favorite audio beep piece for specific event like making a call, receiving message, reminder, alerts and more. 1. Launch Skype program and proceed with login using your account. 2. Then goto Tools > Options using top menu bar. 3. In the ‘Options’ dialog window, click ‘notifications’ tab on left sidebar. 4. Then click ‘Sounds’ option under ‘Notifications’ to view required settings. 5. Click ‘Mute all sounds’ button to disable and mute all sounds. 1. 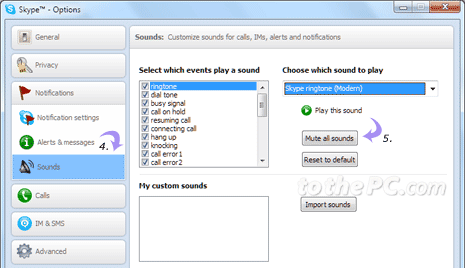 Repeat steps 1 to 4 to open sounds in Skype settings dialog box. 2. Select event for which you want to customize sound. 3. Then select sound that you want to set and play from drop down menu. 4. You can click play button to preview sound before finalizing it for specific event. 5. If you make too many changes and want to revert to original sound settings, just click ‘reset to default’ button for default settings of chat beep sounds for various events in Skype.